October through to the end of April each year. Applications for exchange students will be received from October through to the end of April each year. Students depart the following January for a 12 month exchange. New Zealand is divided into six Rotary Districts and you apply to the District in which you live. To apply via this website, applicants must live within Rotary District 9910 which covers the area north from central Auckland. Applicant’s parents do not have to be members of Rotary. If you apply for an exchange you will attend a selection weekend where you will find out all about the programme and have the chance to meet students from overseas, who are in NZ on exchange, as well as NZ students who have completed an exchange. Successful applicants will attend further briefings and an orientation weekend. IMPORTANT: Before you click the apply now link, are you in our District? Do you live in our Rotary District? 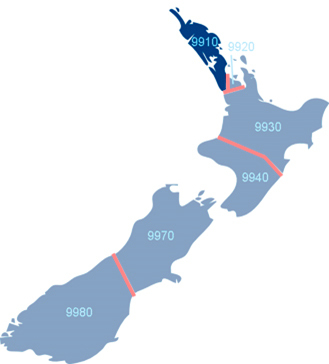 New Zealand is divided into 6 Rotary Districts which accommodate Rotary Membership Clubs. 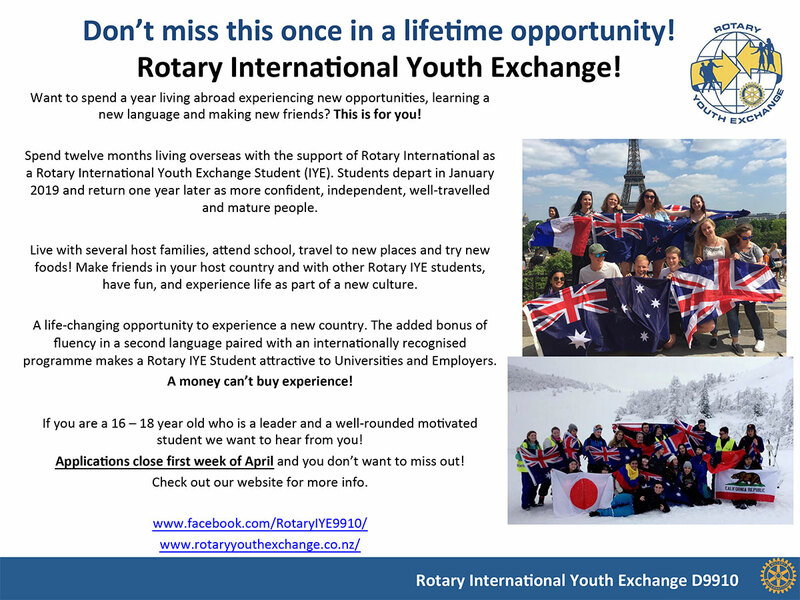 All exchange students are assigned to a Rotary Club who will support and guide your application. Therefore you need to apply to the District within which you live. To apply via this website, you must live in our Rotary District 9910. See map below. Chile, Brazil, USA, Canada, France, Germany, Switzerland, Austria, Sweden, Denmark, Belgium, Finland and Norway. It is also not essential to speak the language of the exchange country, but having taken a language at school is an advantage. A frequent question and the answer is ... yes and no. There are a limited number of exchanges available with each country. When applying for an exchange you can nominate your three preferred countries and we will try our best to accommodate one of your choices.